Cooper’s outdoor space with her own lawn chair and other amenities. Do you own a dog? If so, you probably have a designated outdoor space where your pet can relieve itself. Our dog, Cooper is very much loved and VERY spoiled. 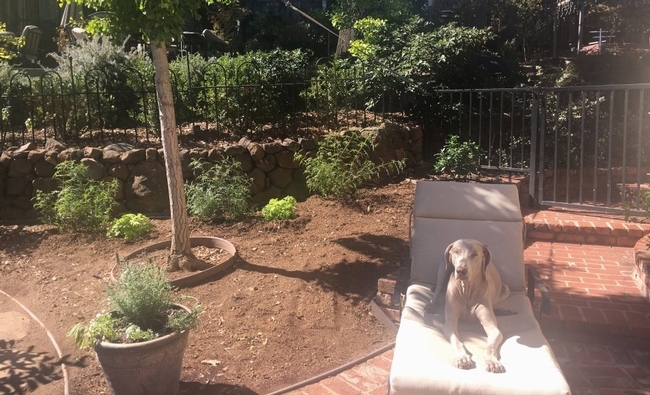 Not only does she have a special outdoor space, she has her own lounge chair, her outdoor area offers both sun and shade, and she has full run of our home, with doggie beds in almost every room! So, as I said, we DO love her, and we are careful to pick up and dispose of her poop. However, her outdoor area has started to smell bad, and I am determined to see if I can fix that. I've reached out to several Master Gardeners, done a fair bit of online research and talked to a couple of our local nurseries to see if plants can make a difference. Below are recommended options for pet owners to try. Flowers: Phlox prefers sun but will tolerate a bit of shade; the plants are quite fragrant and come in white, pink, salmon, purple, red and bi-colored. Dianthus is low-growing, likes full sun and thrives either in containers or in the ground. It has a spicy vanilla-like scent. Try ‘Fruit Punch Sweetie Pie' (pink) or ‘Itsaul White'. Stock is quite fragrant, can grow in part shade or sun and is available in many shades of pink, purple and white. Shrubs for full sun: Roses are good choices. ‘Mr. Lincoln' is scarlet-red with an incredible scent, and ‘Princesse Charlene de Monaco' has double light-apricot to pink flowers. Buddleia (Butterfly bush) will attract butterflies to your garden from mid-summer to mid-fall; try ‘Blue Chip' (purple) or Miss Ruby (magenta). Peonies are shrubby perennials that go completely dormant in winter, but the gorgeous spring flowers and enticing fragrance make it well worth trying. Good choices are ‘Festiva Maxima' (pure white blooms with crimson flecks), ‘Sarah Bernhardt' (medium pink double blooms) and ‘Shirley Temple' (soft pink to ivory white). Shrubs for part sun: Viburnum is a tough spring-blooming plant with a distinctive spicy scent. Check out ‘Spice Girl' (pink),'Fragrant Snowball' (white) or ‘Spice Baby' (white). Daylilies grow in full sun to part shade, but only a few are known for their pleasing aromas — ‘Savanna Debutante' (apricot-yellow), ‘Hyperion' (lemon yellow) and ‘Chance Encounter' (rose/mauve). Trees: Crabapples like full sun, have showy flowers in the spring and provide fruit that birds absolutely love; try ‘Prairiefire' (vibrant pinkish-red buds) or ‘Royal Raindrops' (magenta flowers with deep purple foliage). Trailing option for containers or rock gardens: Sweet Alyssum, works in full sun to part shade. Consider ‘Snow Princess' (white) or ‘Dark Knight' (deep purple). Vines: ‘Scentsation' honeysuckles prefer sun and are extremely prolific and fragrant. Birds and butterflies love this variety. ‘Sweet Autumn' clematis blooms from late summer to fall and has an intoxicating aroma; butterflies and pollinators love its dainty, white star-shaped flowers. Plant in sun to part shade. Of course, many herbs provide a fabulous scent as well as culinary delights. Options include lavender, rosemary, sage, lemon balm, marjoram, thyme, catmint, and mint. Most of the above options can be grown in containers — a great idea since most plants won't survive (much less thrive) with the heavy concentration of nitrogen found in animal urine. Even if you don't own a pet, the recommended plants will not only brighten your landscape but entice you into the garden with their tantalizing scents! Think about using them near an outdoor dining area, gazebo, hammock, or other areas where you like to spend time. You'll be able to take plenty of time out to smell way more than the roses. This article first appeared in the October 15 print issue of the San Jose Mercury News. Minimize fire hazards by removing highly flammable materials and plants (such as Italian cypress, pine, fir, spruce, eucalyptus, junipers, palms, Japanese honeysuckle and some ornamental grasses) from close proximity to your house, and create fire-safe zones with concrete or stone patios, walkways and driveways. Although it really isn't possible to have a “fire-proof” landscape, there are many things you can do to help protect your home from the ravages of fire. The most important is to create a defensible space around the house perimeter. Ideally, you should have a 30-foot “free zone” from all buildings, structures, and decks. This space gives firefighters room to their job if needed. Often firefighters will bypass a home that has little to no defensible area in which to work, opting instead for one they think they will be more likely to save. If at your place it isn't practical to remove all vegetation, it is extremely important to remove any dead plant material — dry leaves, pine needles and highly flammable plants such as Italian cypress, pine, fir, spruce, eucalyptus, junipers, palms, Japanese honeysuckle and some ornamental grasses. Create fire-safe zones by building concrete or stone patios, walkways, and walls. Flower beds, gardens, appropriate ground covers and mulch placed near your home can also serve as a fire-break. 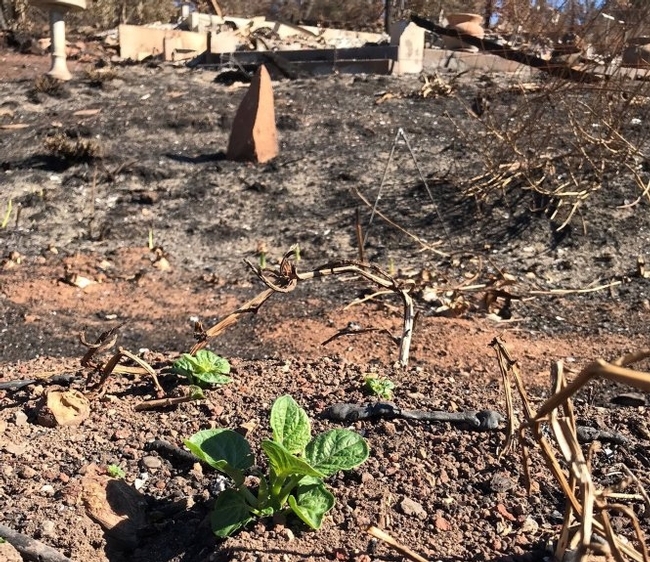 Removing highly flammable plants and replacing them with fire-resistant options is highly recommended — especially if you live in a high-fire zone. What makes a tree or shrub fire-resistant? If it's non-oily, deciduous (drops its leaves in winter), large leaved and/or has high-water content. These fare best when exposed to high heat or fire. To ensure that your plants are as fire resistant as possible, make sure they're healthy, well hydrated and free of dead wood. 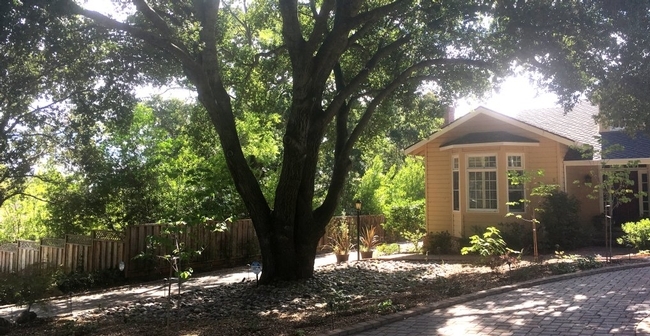 Trees: California live oaks, native redwoods, California bay laurel, maples, citrus, cherry, apple, strawberry tree, dogwood, ash, loquat, ‘Little Gem' magnolia, toyon, white alder, weeping bottlebrush, redbud. Large shrubs: Aloe, ceanothus, cotoneaster, escallonia, currant, pineapple guava, flowering quince, Island bush poppy, Pacific wax myrtle, photinia, pittosporum, mock orange, plumbago, podocarpus, laurel, viburnum. Flowering plants: Azalea, camellia, hibiscus, lavender, monkey flower, California fuchsia, coral bells, society garlic, salvia, rhododendron. Ground covers: Woolley yarrow, Ajuga reptans, purple rockrose, creeping coprosma, creeping thyme, ice plant, mock strawberry, wild strawberry, evergreen candytuft, lantana, Lamium, African daisy, wooly thyme, star jasmine, sedum. Vines: Trumpet vine, potato vine, Cape honeysuckle. Mulching around your trees and shrubs will help them retain moisture, reduce weeds and provide nutrients to the soil. However, if you are in a high fire area, avoid using wood chips and or pine needles, which can feed a fire. If you do have wood-based mulch, make sure to keep it moist, and add a layer of compost on top. Using compost by itself or layers of rocks or pebbles might be a better choice. Raging fires can produce extremely high heat. Investigators of the 2008 Trabing Fire near Watsonville reported that temperatures had reached more than 3,000 degrees. Unfortunately, no plant would survive that! If there is a fire near you, please heed the advice from your local fire authorities and evacuate if and when you are asked to do so. This article first appeared in the August 17 issue of the San Jose Mercury News. Have you been searching for a particular tree or shrub this year and just can't seem to find it anywhere? Local nurseries and growers are scrambling to keep up, but demand — especially for specific cultivars — has caused an extreme shortage of many sought-after plants. With most of the drought water restrictions now removed, people are rushing to replace the plants they lost in the drought. Many people also took advantage of rebates and took out all or part of their lawns. To qualify for a rebate from the state or local water providers, the lawn had to be replaced with plants from an approved list. Each plant was rated for its water efficiency and rebate programs required homeowners to plant a set percentage of their yard and obtain a certain point value based on the plants they chose. Plants with the highest point values were in high demand and sold out quickly. Growers have been scrambling to catch up, but the heavy, frequent rains have put local growers behind in their planting, which has significantly delayed availability. Viktoria Gleason, Green Goods Buyer for Summerwinds Nursery in San Jose, says homeowners are driving what growers are producing. Acacias, especially ‘Cousin Itt', Chinese pistache and some crape myrtles, were at the top of the point list and are now virtually impossible to get. If you are looking for great dry shade shrubs try Loropetalum (fringe plant), which comes in many sizes and colors. Many cultivars of Pieris (lily of the valley) offer bicolored leaves and dainty, bell shaped flowers. 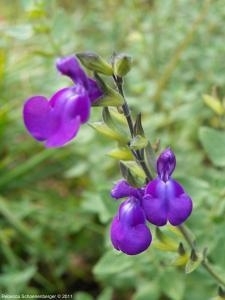 There are salvias in every size and color, and even one for deep shade. Wendy Calhoun, Buyer for Yamagami's Nursery in Cupertino, says in addition to picking the right plant for the right area, people need to understand their irrigation systems. “Most people apply too little water, way too often,” Calhoun says. Plants thrive with infrequent but deep watering. A good rule of thumb, she says, is to apply twice the container size of water once a week. A 1 gallon plant would get 2 gallons of water per week. In extremely hot weather you might need to double that amount twice per week, but no more. Proper watering is the most critical factor in growing healthy plants. Most plants, especially drought tolerant ones such as lavender, rosemary and California natives, fail in their second year, Calhoun says, because of over watering. Curtis Ferris, General Manager at Soquel Nursery Growers in Soquel, says the drought has actually been good for growers and consumers. “People are replacing their thirsty lawns with much better options and we hope they continue to do so,” Ferris says. This article first appeared in the May 20 issue of the San Jose Mercury News. There are good bugs and there are bad bugs. Most Morgan Hill gardeners have battled those bad bugs with varying levels of success. No matter how many pesticides you spray, the pests just seem to keep coming back. Rather than continue using chemicals, you can fight these pests naturally by creating a habitat for beneficial insects. Beneficial insects are those that improve pollination, gobble up or lay their eggs inside insect pests, or speed up decomposition. Common beneficial insects include honeybees, minute pirate bugs, syrphid flies, assassin bugs, tachnid flies, big-eyed bugs, lacewings, native bees, parasitic wasps, butterflies and damsel bugs. Lady beetles are one of the most popular beneficial insects. A single lady beetle may eat 50 aphids a day, but it will fly away if its needs are not being met. You can make your Morgan Hill yard and garden more welcoming to beneficial insects by meeting those needs with year round food, water, and shelter, using native plants. Local insects have evolved using native plants for food and shelter for thousands of years. Hedgerows and clusters of native shrubs and perennials can provide low-maintenance habitat for many beneficial insects. Providing shelter for beneficial insects often means nothing more than providing a source of water and avoiding the use of broad-spectrum pesticides and bug zappers. Pesticides and bug zappers often kill beneficial insects. According to research published in science research journal PLOS One, insect hotels may or may not be effective, but they might help and they do make nice garden art. Since each insect species has its own habitat needs, creating different levels within a landscape, using trees, shrubs, perennial beds, and low-growing ground cover can provide the widest variety of shelter possibilities. Shelter can also take the form of bare patches of soil or sand for ground dwelling solitary bees. Plant a variety of colors and shapes, making sure that food and habitat are available year-round whenever possible. Some beneficial insects love round chive blooms, while others prefer the flat landing area provided by cilantro. Salvia's spikey blooms and daisy-like sunflowers fill out the range of flower shapes. Many delicious herbs, such as rosemary, oregano, dill, and thyme are irresistible to beneficial insects. The rainy days of November are an excellent time to draw or list existing plants, noting when they bloom, their color and blossom shape, and which beneficial insects they attract. The next step is to see what is still needed for the biggest impact. 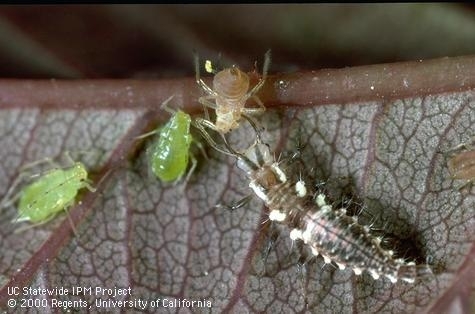 If your Morgan Hill garden has specific pests that attack regularly, you can install plants to attract beneficial insects known to feed on those pests. For more information, visit Master Gardeners or call 408-282-3105, Monday through Friday, 9:30 a.m. to 12:30 p.m. This article first appeared in the November 9 issue of the Morgan Hill Life.